Pokemon GO blamed for illegal border crossing from Canada to U.S.
(Reuters) - Two youths unaware of their surroundings when they were playing Pokemon GO on their cell phones made an illegal border crossing this week from Canada into the United States in a remote part of Montana, U.S. Customs and Border Patrol said. The two, who were not identified, were found by U.S. Border Patrol agents on Thursday, with their attention affixed to their phones as they were trying to hunt down cartoon characters on a journey that took them over the border. "Both juveniles were so captivated by their Pokemon GO games that they lost track of where they were," said Michael Rappold, a spokesman for the agency. The two were reunited with their mothers at a nearby border patrol station, the agency said. The game has been an unexpected success from Spain to Australia, doubling Nintendo's value since the game's launch in the United States earlier this month. Using mobile devices, players search for virtual Pokemon characters that appear to pop up at office spaces, restaurants, museums and other places. 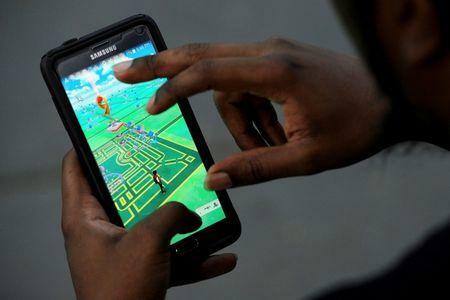 Players score points in various ways, including capturing the Pokemon characters with a flick of a finger on their phone screen. The game was also to blame for a rash of car accidents and a slew of mishaps stemming from distracted players.